Time ticks for the People’s Democratic Party, PDP, in Delta state. The tone is ominous. It signifies endtime. And the exit gate at Osadebe House, the Delta sit of power, now seems to be widening for the hasty exit of the governor, Dr. Ifeanyi Okowa as the March 9 date for the Governorship and State House of Assembly elections beckons. Not surprising therefore that the party with the now seemingly punctured umbrella symbol appears to be suffering acute delusion. Or how else do I explain away the feverish rumpus that characterize every statement that emanates from their heat-oppressed minds. Take the case of the Press Release of Tuesday, March 5, 2019, dubiously titled ” APC PLANNING TO USE EX-MILITANTS DRESSED IN MILITARY UNIFORM TO CAUSE MAYHEM, DISRUPT MARCH 9 ELECTIONS. Written in crass pedestrian language with a tone from the abyss of crudity, PDP embarked on an odyssey of lies and shame in a brazen quest to deceive the good people of Delta state. The whole object of their foul epistle and propaganda was to shake the solidity of APC in Delta State, to smear its credibility and so extract some sympathy and support. But Deltans know better. They know that the PDP are buccaneers, economic and barbaric outlaws who have exploited them and left them in dire poverty since 1999. They know that apart from that of 1999, PDP, has never truly carried out campaigns in Delta state. Their calling is rigging while vocation is violence. They are robust and formidable in the evil and eerie histrionics of writing election results. But I must quickly confess that PDP has actually campaigned this time. Yet the spur is simple. They had to campaign because the federal might has deserted them. That was their barbarous instrument for mindless rigging and atrocious violence. And this then explains their present awful but laughable deja vu. In their nightmares, as defeat stares them in the face, they conjure lamentable pictures of APC’s violence. But Deltans know the truth. They were witnesses to the recent Presidential and National Assembly elections in our dear state. Even though the APC occupies the seat of power in Aso Rock, it was PDP that compromised and ruthlessly used the police and soldiers to rig the elections. They roamed the nooks and crannies of the state with over 30 Hilux buses filled with soldiers and police officers, chasing away APC agents and carting away ballot boxes, unleashing savage and hard-hearted violence where there was little resistance by APC’s vulnerable agents. The stark truth is that the youth in particular and the long exploited people of Delta State in general now feel that APC’s resolve to play by the rule has become a cross. 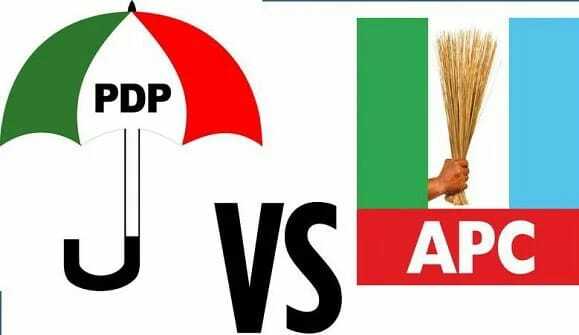 They live with the mortal fear that APC could lose the elections if they continue their politics and policy of abhorrence for violence and rigging. It is therefore a ludicrous irony that the same mendacious PDP is now calling the international community to hear their spurious and equivocating claims. Yet there are iron-cast evidence to show that the PDP is indeed the fraud. Take for instance, the cases in Delta South, in the riverine areas of Burutu, Bomadi and Patani Local Government Areas, LGAs. In these places, the PDP, using the military and compromised INEC officials seized the ballot boxes and result sheets. They thumb-printed these papers and wrote the results. And then accompanied by buses filled with faithless, unpatriotic soldiers, they walked into the collation centres with despicable and monstrous pride and compelled the Collation Officers to announce the very results they wrote with vicious intimidation. This was how Dr. Emmanuel Uduaghan, a former governor of the state and APC’s Senatorial Candidate lost his election. But Deltans’s of Delta South Senatorial District know too well that this diabolic result cannot stand. There are impeccable video evidence that will expose PDP’s deceit, glibness and bad faith before the election tribunal. The hard truth, in the words of John Wooden is that failure isn’t exactly fatal, but failure to change is. PDP in its 20 years has failed to change from its obnoxious resolve to hold Deltans down. They ruled like emperors, too blinded to recognize the solemn fact that power belongs to the people. And it is understandable. They didn’t need the people’s votes to win. They had perfected the art of rigging. They are undertakers, morticians so numb with looting the state that the welfare of the people means nothing to them. But Saturday, March 9, will be judgement day. On that day, in those finest hours, Deltans will tell PDP without any ambiguity that their time is up. PDP will not see the soldiers or policemen to manipulate. They will see patriotic officers who will enforce the law. The PVCs of the people of Delta will speak. Their votes will count. And they will show PDP the exit door into the trash-can of political history.